PIAPS ♥ EGYPTIAN ISLAMOFASCISM!!!!! | AMERICAPHILE RESURGENT!!! ← HANDSHAKE?!?!? NOW, BACK IT UP!!!!!! PIAPS IS EMBRACING AND PROMOTING ISLAMOFASCISM IN THE NAME OF AMERICA!!!!!! 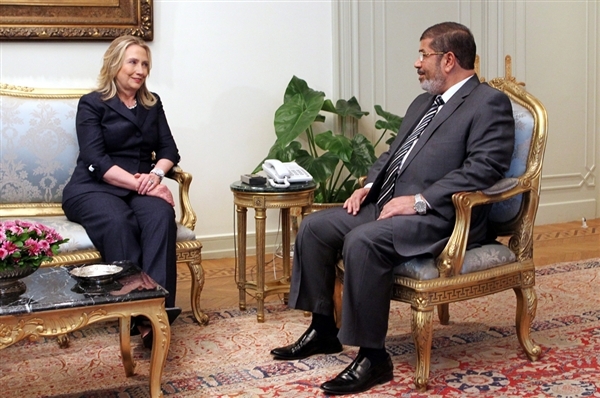 U.S. Secretary of State Hillary [PIAPS] met for the first time Saturday with new President Mohamed Morsi in a fresh push to strengthen U.S.-Egyptian relations as the country enters an era of unpredictability in which an Islam[OFASCIST] leader is clashing with a secular military over control of the nation. MITT ROMNEY’S CAMPAIGN MUST BRING THIS ACT OF TREASON INTO THIS YEAR’S DEBATES!!!!!! CAN WE AFFORD TO HAVE AMERICA’S SECURITY COMPROMISED SIMPLY BECAUSE PIAPS IS BUMPING DOUGHNUTS WITH A MUSLIM?!?!?! FURTHERMORE, DOES ANYONE STILL DOUBT THAT WE ARE IN THE LAST DAYS?!?!?!? Pingback: WELL-INFORMED EGYPTIANS VS. PIAPS!!!!!! « AMERICAPHILE RESURGENT!!! Pingback: PIAPS’ NEXT ACT OF TREASON: THE RELEASE OF THE BLIND SHEIKH!!!!! « AMERICAPHILE RESURGENT!!! Pingback: BOSTON BOMBERS EXPOSED AS ISLAMOFASCISTS!!!!!! | AMERICAPHILE RESURGENT!! !